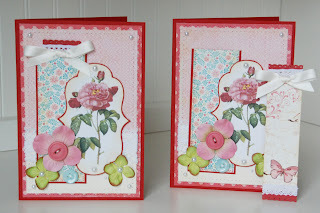 A Blessed Life-everyday life with Lisa Dorsey: Fresh and Fun Handmade Cards Blog Hop and GIVEAWAY! 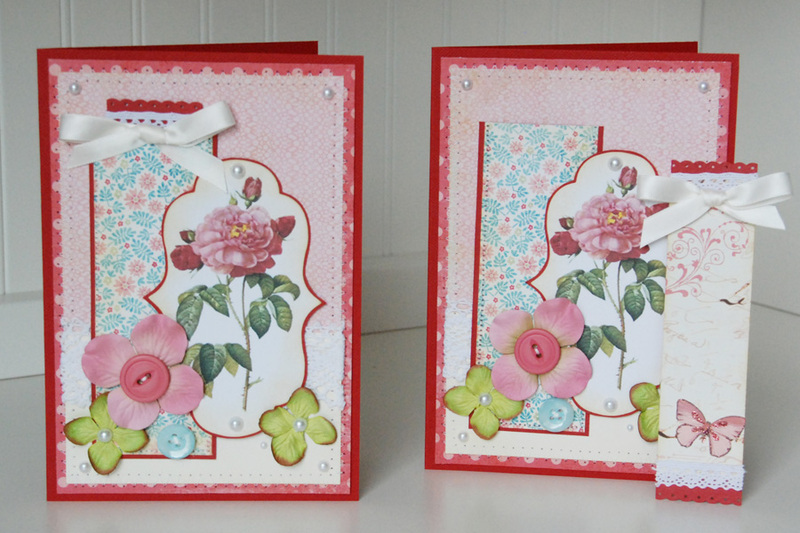 Fresh and Fun Handmade Cards Blog Hop and GIVEAWAY! I am so excited to be a part of a very cool blog hop this morning. Several months ago Kimber asked me to contribute some cards to a new book she was creating called Fresh and Fun Handmade Cards. I absolutely love with the concept behind this book. All cards are shown as a basic card and then how you can step them up to make them interactive. The day has finally come and the book is officially in stores. You can find it at Amazon here. I thought I would share one of the cards that I created for the book. The long strip of blue floral paper is machine stitched on three sides to create a pocket that holds a bookmark for the recipient of the card. Now it is time to win a copy of this awesome book! All you have to do is leave a comment here and we will pick a from my blog on Monday to recieve a copy of the book, signed by Kimber. Then make sure you hop on the the incredibly talented Rae Barthel's blog for another chance to win. Here is the line up in case you missed someone. Congratulations on your publications, Lisa! I hadn't heard about this book and I'm excited to see more. I love your card and the idea of making a pocket for a book mark! Oh what fun!! Would love to win this! This books sounds so awesome...Filled with lots of goodies...thanks for the chance to win. This card is so pretty! Would be a great teacher card! Beautiful card, Lisa! Simple, fresh and with a surprise inside! I love it and can't wait to make one. This book is top of my WishList and I will anxiously wait 'til I can get my hands on one. Thank you so much! Such a beautiful card and sounds like a wonderful book. Would love to win it. This book looks amazing. Thank you for a chance to win. 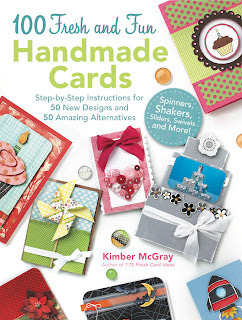 This book looks fabulous, and I love the idea of stashing little gifts on cards. Very cool! Incredible card. Love the bookmark. Congrats on your publication. Love the idea of the bookmark in the card. Love the card. Thanks for sharing. Would love to win a copy! I love the bookmark card. I would love a copy of Kimber's book. So fun!!! I am so thrilled to have a chance to win this new book! Beautiful card Lisa! Thanks for the chance to win! Awesome card! This book looks fantastic! Thanks for providing a chance to win it. Love you stuff! Would love to win the book! Thanks. What a beautiful card!! I love the idea of a bookmark, too. Thanks for the chance at winning this book, it would be put to very good use!! Love to make cards and so excited to see all the new ideas in this book! Sounds like such a fun book! Love your card! Awesome Lisa!!! Congrats!!! your card is beautiful and the book looks aamzing!!! How beautiful this card is. Can't wait to get my hands on this book. Lovely lovely card and congrats on the pub! CONGRATS on the book pub!!! That is AWESOME!!!! I loveeeeeee your cards!!! Just BEAUTIFUL!!!!!! Thanks for the chance to win!! The card is fabulous! Thank-you for a chance to win the book. Very cool book. I'd love to win. Such great ideas from the blog hop alone. I would love to have a copy of Kimber's book on my shelves. Thanks for the chance to win. Great sample card from Kimber's book; please enter me in the drawing for a copy. How cute. thanks for the good ideas. I want to branch out a bit. I love to give bookmarks. I know a lot of readers. Nice job. This looks like a must have book! Thanks for the chance to win it. Congratultions to you being included in this new book! I love the card and how the bookmark is removable. I love making cards, so I know I would love this book. Thanks for a chance to win! Great book! Lots of ideas and creativeness to learn from. thanks for the chance to win. Love this card!! The bookmark is a fabulous idea!! thanks for hosting the contest! I love all the ideas. Your book mark pocket is so clever! Fabulous cards. So much fun. This is a new way to do cards for me, never done anything like interactive before. can't wait to play. Thanks for the chance to win. I love your sample card with the bookmark. I'm happy, too, to be introduced to your blog. Interactive and great!!!! Thanks for the inside peak! This looks like such a great book with lots of ideas that would be an inspiration for some really neat cards! Beautiful card! Love the idea of the bookmark pocket! I'd love this book! These are my kind of cards! How clever to put a bookmark in your card---but then, that's just YOU, Lisa! :-) So clever and creative. Thanks for the chance to win a copy of the new book. What a perfect card to give to someone along with a couple of books! Thanks for the great idea and the chance to win. I would LOVE to win this book and check out each project in it! Wow, such a generous giveaway. I would so love this book :) Thanks for the opportunity to win it. Your card is awesome!!! Thank you for the chance to win! Oh what fun this book will be! Congratulations on creating such fun! Looks lovely--would really enjoy a copy of this book. Super cute bookmark! I hadn't thought of using it on the front of a card...that's exactly the kind of thing that makes me love Kimber's books! Such a sweet card! My family is big into reading and any of them would love to get a card with a bookmark. Pretty card! I love the color combo! The book looks fabulous... can't wait to get a copy! Love your bookmark idea! It's just gorgeous! What a lovely card - and to get a gift with it - perfection! I would so love to have a copy of this book - I am excited about learning to make cards like this! Good luck everyone. We should all be so lucky to own this book! Hi! i love the card and the bookmark just MAKES! it so special! thanks for sharing. I love to give handmade bookmarks with my cards too! Wow this book looks like fabulous fun! I love Kimber's books! Thanks so much for these FUN Blog Hops! Keeps us up to date on all of you! Great idea - this would really come in handy. Gorgeous card! Would love to win this book. Thanks! I love the cards and the bookmark. Thanks for sharing! fabulous card. What a fun book to have. Very pretty card and I like the pocket for the bookmark. Wow! Your card is absolutely beautiful. No wonder it made it into the book. I really love the concept of the book and would LOVE to have a copy of it. Can't wait to see all the great projects inside. Thanks for sharing your creation and for the chance to win! I would love to have a copy of this because I have never attempted an interactive card-yours is beautiful! You ladies are immensely talented and I would love to be inspired with a copy of this book! I would love to win this book. There are some truly inspiring ideas inside. Beautiful card, Lisa!Thank you so much! I love the card! This book would be such fun to drool over! Fun cards!! I would love to win a copy of the book - thanks for the chance. What a nice idea to include a bookmark in a card. I think I can do that! I've been looking for a way to add some interest to my cards and this book would be just the thing! Thank you so much for this fun giveaway! Your card is lovely and I love the idea of including a bookmark, thanks for the chance to win! Love this card and bookmark - thanks for sharing and a chance to win. Looks like an awesome book! Thanks for a chance to win. Wow! What a beautiful card, Lisa! Love the interactive pocket with the bookmark and love the sweet vintage style. Congratulations, my friend!